In Vernon Hargreaves’ final game of his freshman season, the Gators got beat very convincingly by FSU by a score of 37-7. It was the worst home defeat since 1979 for Florida. With Jameis Winston throwing to him, Benjamin ended up with nine catches for 212 yards and 3 touchdowns. Hargreaves wasn’t in coverage on the first two scores but he gave up a four-yard touchdown pass to Benjamin. It was the first touchdown he allowed in his collegiate career and has kept himself motivated for when he got the chance to face him again. He’ll finally get that opportunity Monday night. 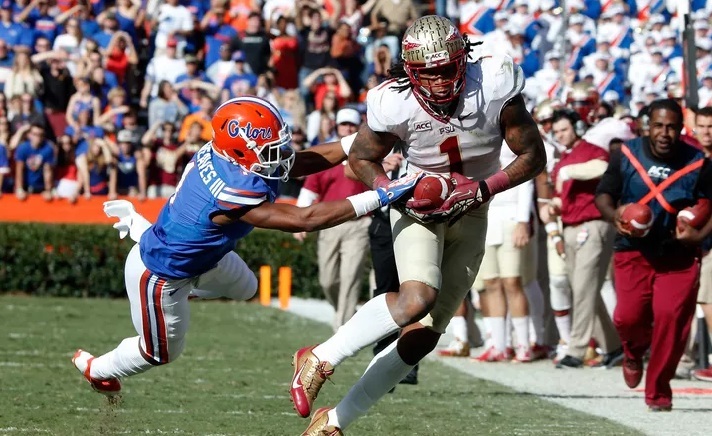 Hargreaves remembers Benjamin well and recalled a game, in which he gave up a touchdown to the former Seminole receiver. Hargreaves considers Benjamin to be an extremely tough competitor that likes to win and likes to play hard, much like himself. It will be an exciting rematch in Hargreaves’ eyes and will enjoy it being on a much bigger stage. There’s no way to know how much the two will match up yet but, let’s hope this motivation is enough to slow him down so Carolina will have one less weapon on offense whenever they need it. Should the Bucs Look at Recently Waived Kelvin Benjamin? Jameis Winston speaks highly of Roberto Aguayo.